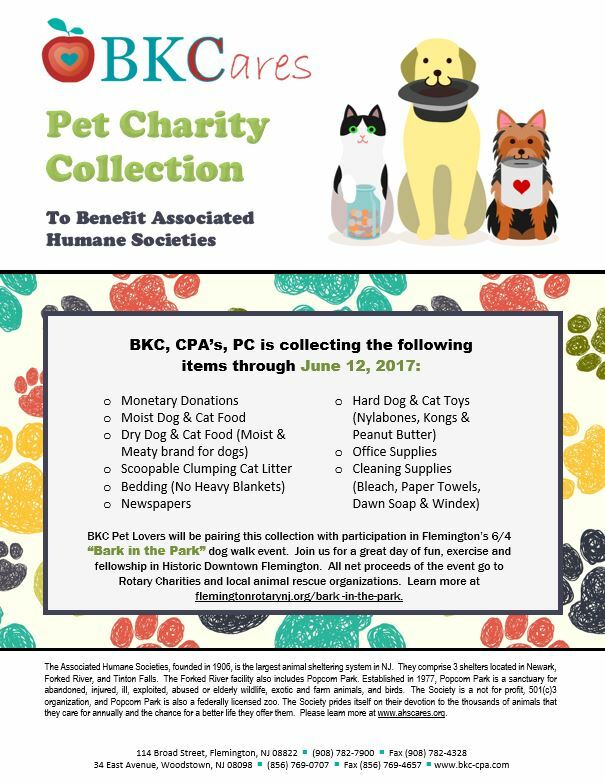 BKC, CPAs, PC will be collecting pet supplies in the Flemington & Woodstown offices to benefit “Associated Humane Societies” through June 12, 2017. BKC Pet Lovers will be pairing this collection with participation in Flemington’s 6/4 “Bark in the Park” dog walk event. Join us for a great day of fun, exercise and fellowship in Historic Downtown Flemington. All net proceeds of the event go to Rotary Charities and local animal rescue organizations. Learn more at flemingtonrotarynj.org/bark -in-the-park. The organization benefiting from our collection is Associated Humane Societies, which was founded in 1906, and is the largest animal sheltering system in NJ. They comprise 3 shelters located in Newark, Forked River, and Tinton Falls. The Forked River facility also includes Popcorn Park. Established in 1977, Popcorn Park is a sanctuary for abandoned, injured, ill, exploited, abused or elderly wildlife, exotic and farm animals, and birds. The Society is a not for profit, 501(c)3 organization, and Popcorn Park is also a federally licensed zoo. The Society prides itself on their devotion to the thousands of animals that they care for annually and the chance for a better life they offer them. Please learn more at www.ahscares.org. Contact us if you’d like to coordinate drop off of your donations, or for more information. Visit our blog to follow our other charitable events.